Siqalo Lodge at Royal Jozini - Lavumisa Accommodation. 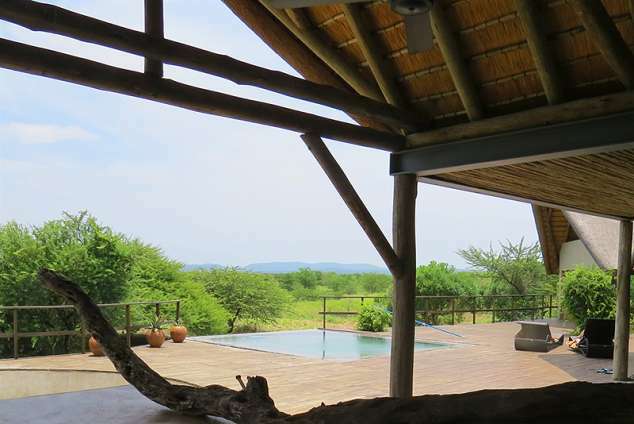 Siqalo is a large, dramatic lodge with its high thatched roof and it offers guests a communal entertainment area with a bar, swimming pool and boma area located at the main lodge. It has two stand-alone chalets available for rental and both have a small kitchenette (with gas ring to boil a kettle or fry eggs and bacon, and a bar fridge to keep drinks cool). Hippo Lodge sleeps two - it consists of a bedroom with a queen bed, shower, toilet, wash hand basin, kitchenette and it is tucked in a grove of Tambuti trees. Warthog Lodge is a family chalet that sleeps 4 - queen bed and two singles in one room, with kitchenette, shower, toilet and wash-hand basin. Both have a covered deck with table and chairs to enjoy the ambience of the bush. Guests in Warthog and Hippo bedrooms are welcome to utilise the main lodge kitchen for food preparation, the pool, braai and boma areas. This dramatic lodge is situated on the waterfront and with its vast decks to enjoy the outdoors, is a place from where you can enjoy nature at its best. Warthog and Hippo rooms are serviced daily by the live in housekeeper. We are able to offer boat charters for game spotting from the Lake, or for tiger fishing. Should guests require Internet or cell connectivity whilst in Swaziland, we recommend that "roaming" be organised before departure. 3104 page views since 26 May, 2015.